Trojan J185P-AC Floor Machine Battery, Free Delivery to many locations in the Northeast. 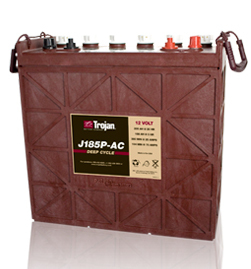 Trojan J185P-AC Deep Cycle Battery, Free Delivery to many locations in the Northeast. The Trojan J185P-AC batteries are sold with core exchanged at the time of the delivery. Length 15" Width 7" Height 14.6"